Come join us for the Meetup which we are organising for Everyone. 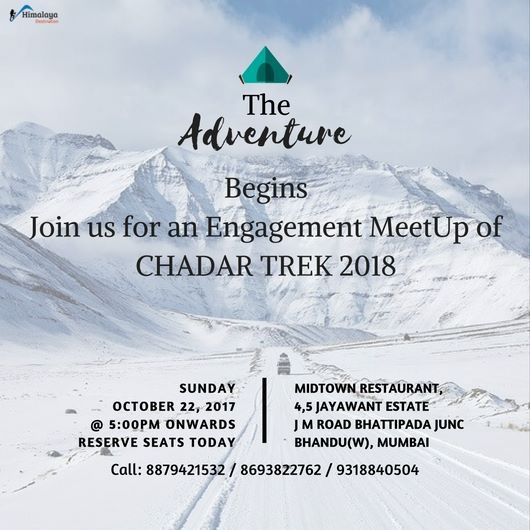 🎯 Objective: Main obejctive of this meetup is to gather everyone and notify people with Chadar Trek expedition 2018 ☃ During which we would be explaining you about the trek and giving you all the detailed information about trekking. Fruitful and helpful Meetup which will not only help you in knowing about chadar trek but also quick session for Safety procedures and precautions to be taken along the trek. 🤔 Chadar Trek - Where, Why and How? 📜 All in one an informative and helpful session which will help you further in all your trekking adventure..
👨‍🏫 Conducted by Mahendra Mahajan : Expert / Mountaineer who is also a trainer in many Mountaineering Institute. Director of Himalaya Destination, Deputy Director of Himalayan rescue team, Rescue award holder. 📝 No Entries without Registrations Allowed..